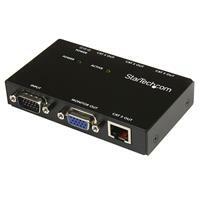 The ST1214T 4 Port VGA Video Extender over Cat 5 allows a single VGA source to be broadcast to up to four remote displays at distances of up to 500 feet (150 meters). 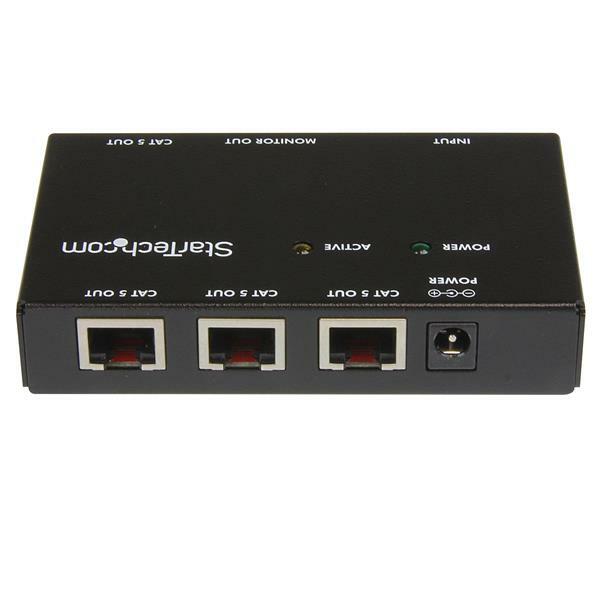 Designed for use with our ST121 VGA Video over Cat 5 extension series of devices, the ST1214T is one of many options designed to help you create a custom VGA distribution and extension solution for many applications including digital signage and video conferencing. Consisting of the transmitter unit only, this product requires a single ST121R receiver unit per remote display that you are connecting. If you are looking for an eight port transmitter solution, we offer our ST1218T 8 port VGA extender unit. For even more versatility, the ST121EXT VGA over Cat 5 Repeater can be used to increase the total VGA extension distance by an additional 500 feet(150 meters), allowing the original VGA signal to be broadcast a total distance of 1000 feet (300 meters) from transmitter to receiver. Similarly, up to three repeater units can be used between the transmitter and receiver units allowing a monitor to be connected at each repeater station , while further extending the total distance between the transmitter and receiver units. Why can't I use a video extender with multiple video outputs to get independent or extended displays? 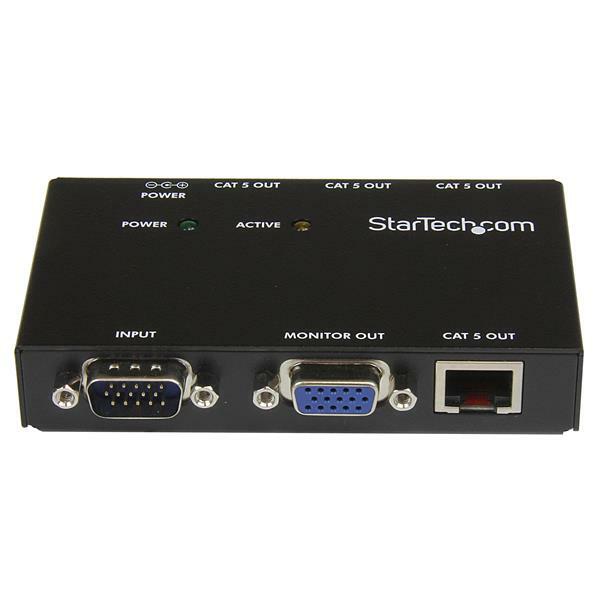 Although there are multiple video outputs on certain video extenders at StarTech.com, these do not create independent displays. Instead, the input to the video extenders with multiple outputs gets mirrored or duplicated. This is because video extenders have built-in video splitters to allow for multiple video outputs. For more information about how mirroring works, refer to the following FAQ: https://www.startech.com/support/faqs/technical-support?topic=video#mirror-span-extend. Note: The ST12MHDLAN can be used to create a video wall which allows for independent displays. For more information about the ST12MHDLAN, refer to the product page for ST12MDHLAN: http://www.startech.com/ST12MHDLAN. Our office bought 4 of these last year for two buildings each with 8 displayboards in them. They have been going strong ever since! 5 years and running!